On-site Registration is NOT accepted. ・Fees for this meeting are paid on a Japanese yen basis. ・The regular registration fee includes(all categories) Workshop attendance fee, Conference bag, Name tag, booklet(short proceedings，Program), USB(fullproceedings), Banquet, Coffee break, and Welcome party. ・Early Registration by online will be until April 23 (UTC). ・Late registration by online will be from April 24 to May 23 (UTC). ・No on-site registration is accepted. Pre-registration by online will be until May 23 (UTC). ・Please ensure that at least one author of the accepted paper must do the early registration. ・Refunds will not be proceeded after May 17, 2014." As of July 2012, Japan had taken measures concerning the waiver of visa requirements with 61 countries and regions, as shown in the List of Countries and Regions That Have Visa Exemption Arrangements with Japan. Nationals of these countries and regions holding valid passports can apply for landing permission for short-term stays for such purposes as sightseeing and participating in a conference without obtaining a visa. For details, please see the web-site of the Ministry of Foreign Affairs of Japan. To obtain the invitation letter for visa application, please send us a letter of recommendation（if not author of accepted papers), and a copy of your passport via e-mail. The letter will be provided to person who has completed registration and payment. The student grant depends on the number of applicants and will be given at the conference. Please click "here" for the detailed information. Approx 8min, walk from the exit 2 of Marutamachi Station. Exit 6 of Imadegawa Station. From JR Kyoto Station 15minutes. 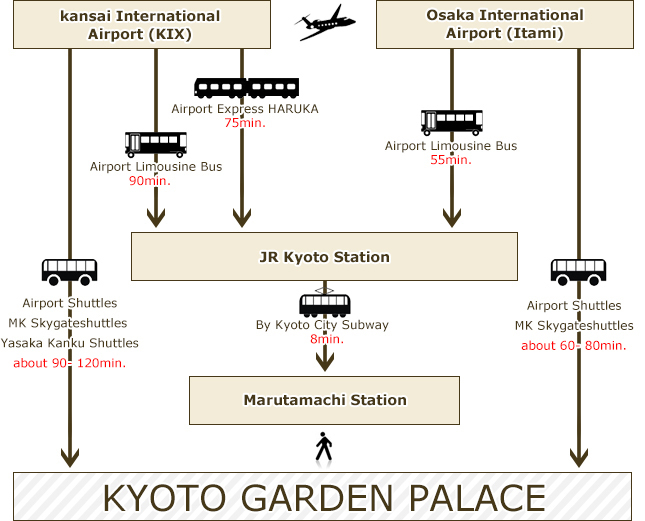 From Hankyu Karasuma Station approx 10minutes.From Meishin Express way Kyoto South interchange 30minutes via Sanjo st.From Meishin Expressway Kyoto Southinterchange 30minutes via Route 1 To-ji Temple.